The unique animals native to Australia are a top tourist attraction. In fact, the iconic kangaroos and koala bears are on everyone’s “must see” list. You won’t need to search the wilds to find them; there are plenty of reserves, sanctuaries, and zoos to add to your itinerary. You probably have an idea of what a kangaroo looks like. Maybe you’ve read the children’s book, “Katy No-Pocket” and you think kangaroos are tall with reddish brown fur. If so, you are in good company as the most widely familiar and the largest kangaroo is the Red Kangaroo. But don’t be surprised to see kangaroos not only red, but in shades of brown or grey or a combination. The Red Kangaroo is just one of 50 species of kangaroos and wallabies. To fully understand what to expect, let’s start with the basics. Marsupials are a subclass of mammals found primarily in Australia. They’re quite distinct as they have pouches with mammary glands and most of them carry and feed their young in their pouch. The most widely recognized marsupials are kangaroos, wallabies, koalas, possums, opossums, wombats, and the Tasmanian devil. Macropods are plant-eating marsupials that include kangaroos and wallabies. 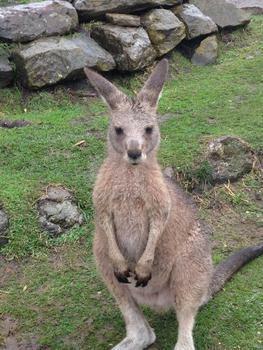 Wallabies are small- or mid-sized macropods and they look like kangaroos. There are four species of kangaroos: the red kangaroo, the eastern grey kangaroo, the western grey kangaroo, and the antilopine kangaroo. Adult male kangaroos are called buck, boomer, or jack while adult females are called doe, flyer, or jill. Kangaroo babies are called joey, and they stay in their mom’s pouch for ten months. Kangaroos are social animals, living and traveling in groups known as a herd or troop. Australians refer to kangaroo groups as a mob. Kangaroos are the only large animal that moves primarily by hopping and they can travel at speeds of up to 30 miles per hour. Interestingly, they cannot move backward. Koalas are not bears but marsupials. The females carry their babies in their pouches for six months. Koalas not only like to live in eucalyptus trees, they rarely leave them, often sleeping up to 18 hours a day in the forks of the tree branches. 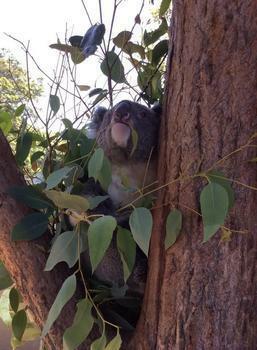 Koalas feed on the eucalyptus leaves and they can eat up to two and half pounds of leaves a day. They don’t need to drink as they get all the moisture they need from the leaves, but in times of drought, they can drink from water sources. Wombats, nocturnal animals, are grey in color and pudgy-looking like a beaver. They not only like to burrow, but they live in their burrows which can be quite extensive. Tasmanian devils, the size of a small dog, live on the island of Tasmania. They have powerful jaws and they can seriously injure if they bite. They too are nocturnal and like to sleep in hollow logs or old wombat burrows. The one thing all Australian animals have in common is that they’re photogenic. So snap away and enjoy these extraordinary creatures.